How do you make yourself stand out amongst all of the competition when applying for jobs? After all, most jobs get multiple applications and many of the applicants have similar levels of education, experience, etc. There are many ideas about this, but the one my colleagues and I have had the most success with is a resume that tells a story about the way you will bring value to the organization and uses visual design to emphasize key elements. The biggest mistake people make when crafting their resumes is thinking that the same communication guidelines that govern a great presentation don’t apply. But consider this: in both great presentations and great resumes, you need to present only the highest-quality information, in a way that is respectful of your audience’s time, and in a manner that is easy to access. By doing so you help your audience understand why you and/or your ideas are so valuable. 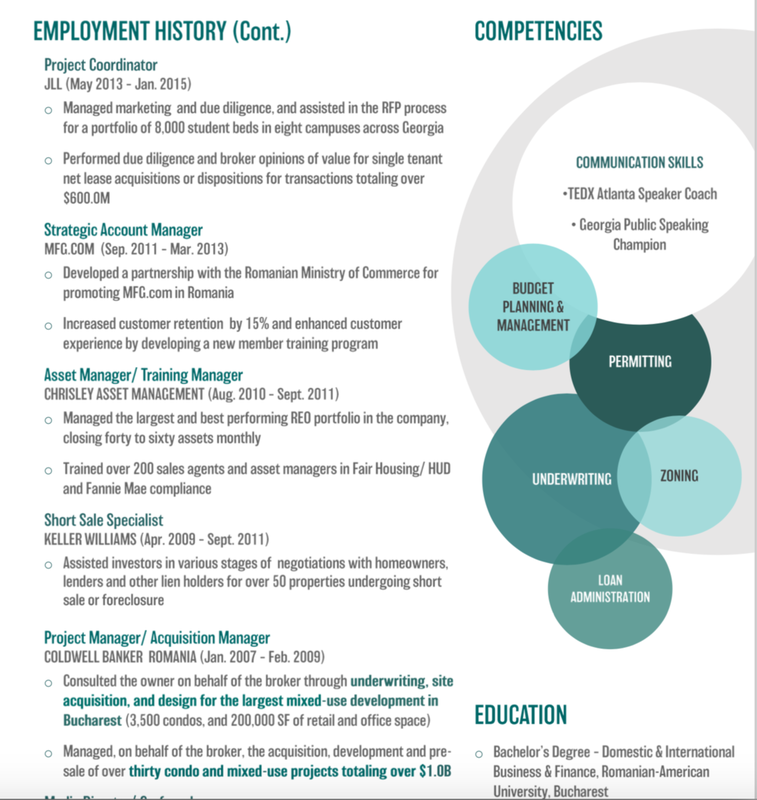 Showing is sometimes better than telling, so here’s Diana’s real resume (that got her numerous interviews and competitive offers), and a breakdown of how she told a story about both her experience and what kind of employee she will be. 1. First, she knows that employers are almost always short on both time and attention, so she added a quick, bullet-pointed summary at the top for a brief overview. Diana not only gave them valuable info right off the bat, she showed them how much she values their time. 2. Second, Diana made sure that key points in her employment history were in bold in order to draw attention to them. She literally made herself stand out in this way. 3. Next, take a look at the flow from “Development Experience” down to “How I Added Value.” It’s a visual journey that guides the reader through what she’s accomplished, and she gives them numerous concrete examples of how she added value that are easy to see and understand. 4. For each entry in her employment history, instead of listing tasks she performed she gives us 1-2 key takeaways that are all about the value she added. After all, does the employer really need to know that you did “administrative tasks” or the like? 5. To compensate for the lack of specific tasks, she has “Competency” bubbles in the sidebar which shows just how proficient she is in a variety of important skill sets. Note that because Diana is originally from Romania, she made her “Communication Skills” bubble especially large and listed 2 key examples so as to address any concerns about her English fluency. 6. She uses design elements to create hierarchy, organize multiple elements in a way that’s easy to understand, and make it interesting to look at. Don’t worry if you’re not a designer, Diana isn’t either; there are numerous online resources (Fiverr, Canva, graphic design students) who can help design your resume at an affordable rate. Excellent communication skills aren’t just for the interview. After all, you only get the interview by presenting your case well through your resume and related application materials. The same guidelines that govern a great presentation also apply to anything you create that is meant to share information about yourself, your expertise, and your ideas. Want more content like this delivered to your inbox? Would you like access to FREE resources, including a speech writing guide? Then join my email newsletter!